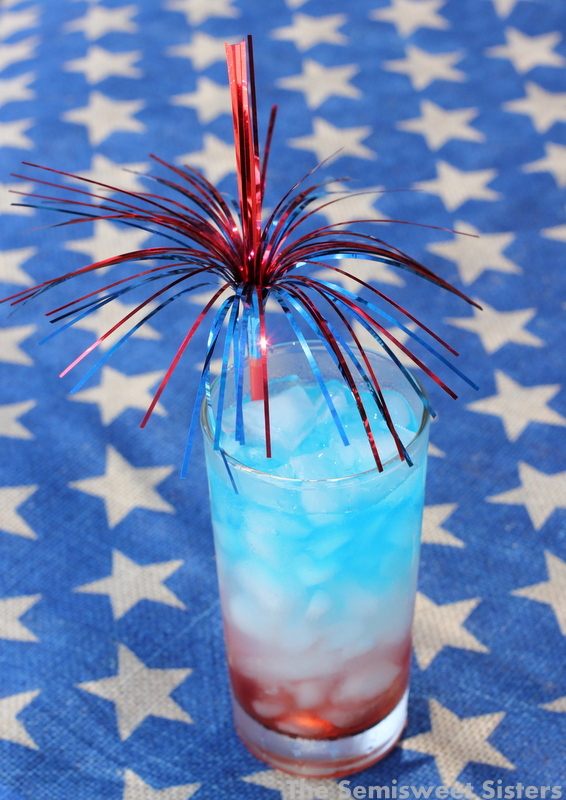 A layered Red, White, & Blue Drink for the 4th of July (Kid-Friendly too). It’s that time of the year where everything is red, white, & blue & I was feeling patriotic. 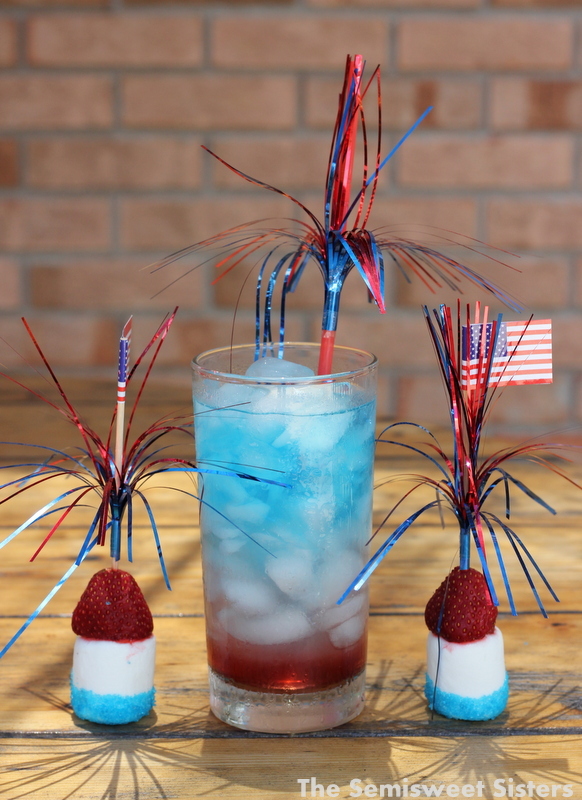 So, when my sister & niece decided to make those cute Patriotic Strawberry Marshmallows in the picture above I knew I had to make this layered drink to go with them. I first saw this layered drink idea at In Katrina’s Kitchen. Her recipe calls from Sobe Pina Colada for the white but I looked at the grocery stores & gas station & couldn’t find it anywhere so I used Gatorade Glacier-Cherry instead. All you need are 3 drinks with different sugar contents. You need one with low/no sugar, one with medium sugar content, & one with high sugar content & lots of ice. Who knew layered drinks where so easy to make? 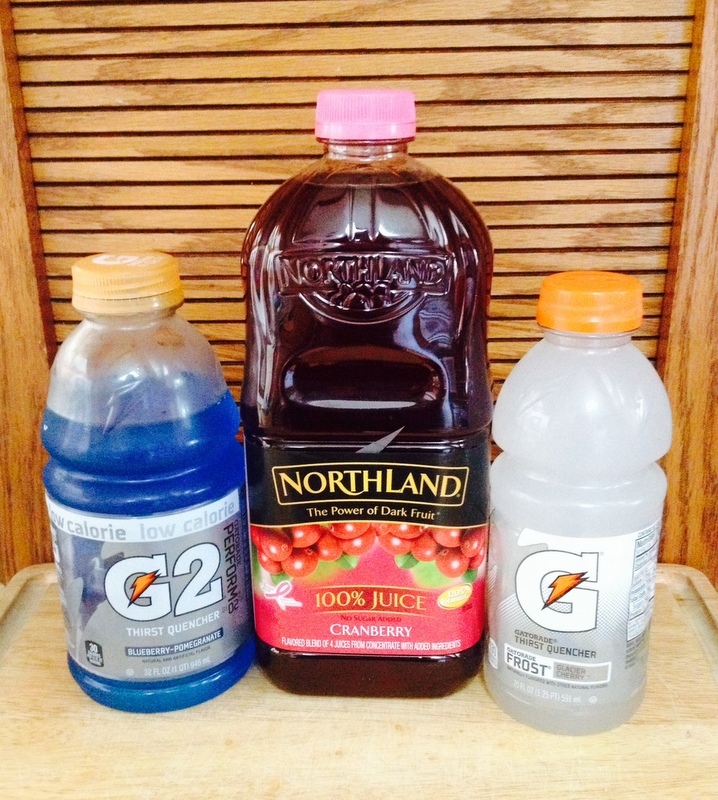 Here are a few more options for different drinks you can also use: Hawaiian Punch, Powerade Berry Blast, & Sprite Zero/Diet 7UP. I found smaller ice works best, I used a mix of regular cubes & crushed. The festive firework straws are from Hobby Lobby. Start by filling a glass ⅓ the way with ice/crushed ice. Start with the highest sugar content drink which in this case is the Cranberry. Pour the Cranberry juice ⅓ of the way up. Next fill the glass all the way to the top with ice. Take your drink with the medium sugar content (the white Gatorade) and Slowly, Very Slowly pour down over the ice so it runs slowly through the ice, til your glass is ⅔rds full. Lastly, Slowly pour your blue Gatorade with low or no sugar to the top of the glass. Enjoy. Happy 4th of July!